Every customer wants respect and, of course, you want to give them that respect. The question is: How? What’s perceived as respectful by one generation may be perceived as an inconvenience by another. We’ve previously taken a look at how the values of Millennials shape their perceptions of respect, and what that means for customer service engagements. In this blog post, we take a look at the oft-ignored Generation X. Tip #1: Give them options. Generation X grew up at a time when both parents worked out of the house and divorce rates soared. As latch-key kids, they came home from school to empty houses. As a result, Gen-Xers had to learn to take care of themselves at an early age. As adults, they are competent and confident. They value self-reliance and independence. Customer service organizations can appeal to these values by giving Gen-Xers options for paying bills, for example, and engaging with customer service on their own terms. Gen-Xers’ perceptions of the world are largely shaped by having witnessed politicians lie and their parents get laid off. Although they can show a high degree of brand loyalty, they are also skeptical of institutions and have an anti-establishment mentality. They don’t respond well to rules and will test authority if given the chance. Treat Gen-X customers as individuals and address each issue on its own terms. Advise customer service agents to do what makes sense to resolve problems – even if it means going against corporate policy. Tip #3: Anticipate their needs. Raised by the generation that invented the 50-hour work week, Gen-Xers reject the notion of ten-hour work days. While they enjoy work, they seek work-life balance, even if it means sacrificing advancement. However, balancing work and life is a constant struggle and anything that saves them time is highly valued. Customer service organizations should look for ways to anticipate Gen-Xer’s needs through proactive notifications and confirmations. Tip #4: Cut the small talk. Gen-Xers are the ultimate multi-taskers – and they have to be. Many are taking care of aging parents while raising the next generation. They are outcome-and task-oriented, so when it comes to a customer service matter, they simply want to get it done. For this reason, customer service agents should take their cue from the customer and mirror their communication style. Gen-Xers are likely to skip the small talk and get straight to the matter at hand, speaking directly and sharing info immediately. Take their lead, and avoid making them repeat their issue to multiple agents. Tip #5: Use technology wisely. Gen-Xers are technically savvy. They appreciate technology for its ability to help them get more done, faster and easier. However, they are also aware of the risks that come from sharing personal information online and with customer service agents. Customer service organizations should consider how and when they use technology to provide an efficient but secure interaction. For example, a PCI DSS-compliant microsite provides a safe payment transaction platform outside of the contact center and eliminates the need for customers to provide sensitive credit card information to agents. In order to meet Generation X’s customer service expectations, your organization has to be flexible and proactive. But that’s just the beginning. To learn more about this generation’s preferences – and how omnichannel can help you meet them – download our white paper. 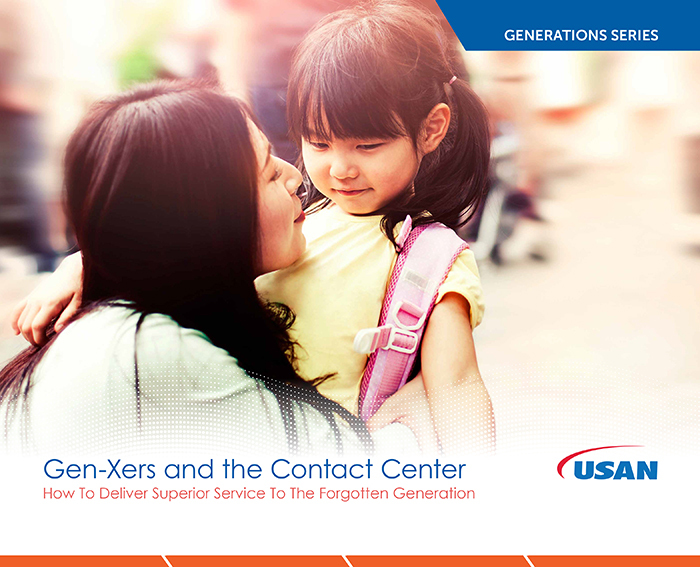 For more information about Gen X and Contact Centers, download the white paper “Gen-Xers and the Contact Center” our latest in the white paper series “Generations and the Contact Center”.